San Bernardino, California: On December 2, 2015 Syed Rizwain Farook and Tashfeen Malik, a married couple, aggressively opened fire during a holiday party at the Inland Regional Center; a developmental facility. Reportedly, at least 14 people died and 22 became injured; most of these individuals were employees for the county. Investigators stated that the killers attempted to cover their tracks by destroying emails, cellphones, and other electronics at their home in Redlands, California. 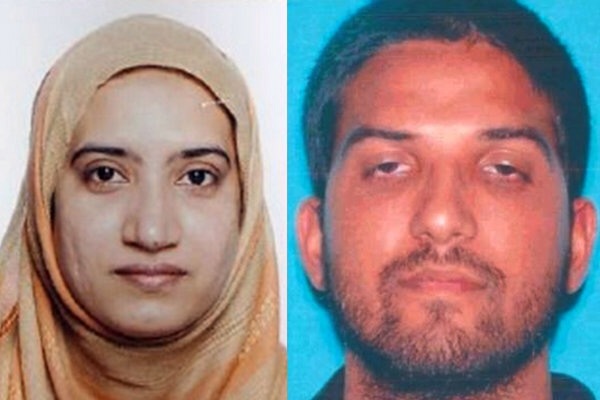 Both Syed Farook and Tashfeen Malik, were assassinated in a shootout with law enforcement. Farook, who was actually born in the United States and worked for the county, reportedly along with his wife Malik, who was a native of Pakistan, had an arsenal of ammunition and several pipe bombs in their home. Enrique Marquez, a friend of Farook and Malik, allegedly bought two of the guns used in the carnage. Agents have searched his home, seizing potential evidence, and Marquez has been interviewed repeatedly. There’s no information if Marquez is a potential suspect at this moment. Also, there’s no information on Mr. Marquez’s mental health status. Although the father is allegedly mentally ill, there’s no linkage between father and son. Perhaps there is. However, because of heavy investigation, information is not yet publicly divulged. The motive behind the shooting remains inconclusive; however investigative officials, are ruling it an act of terrorism. Malik reportedly sworn allegiance with ISIS; nevertheless, it’s too early into the investigation to collect information surrounding the motivation behind the allegiance Malik reportedly made. Previous PostLife As a Transgender Next PostEnrique Marquez arrested in connection with the San Bernardino shooting.